Procol Harum were already into their fifth line-up when, in 1973, they released their sixth studio album, Grand Hotel. With guitarist Robin Trower and his replacement for Live in Concert with the Edmonton Orchestra, Dave Ball, both gone, Mick Grabham, ex of Ladbroke Grove country rockers Cochise, joined the fold and along with Alan Cartwright on bass, Procol Harum were back to being a five-piece. Grand Hotel also saw a triumphant return to the symphonic sound they had been drifting away from on the previous studio albums, Home and Broken Barricades. As with the earlier albums it’s Gary Brooker’s piano that takes the lead, and with Alan Cartwright’s arrival freeing him from bass duties, Chris Copping provides sterling support on the organ, enriching the melodies in a far less 'hands-on' manner than previous Hammond-maestro, Matthew Fisher. The album begins in noble style with a track that sits comfortably amongst the best that Procol Harum ever knocked out. Grand Hotel gives the album its name and the listener a lavishly dramatic example of symphonic rock at its very best. This is the stuff of movie soundtracks, belted out with incredible finesse by the band that could never be surpassed when it came to this sort of thing. Not by Queen, ELO or anybody. As the cover of the album suggests, the song evokes a feel of 1920s' grandeur, with the opulent air of a hotel exclusive to the rich and the famous prevalent throughout. The inclusion of full orchestral and choir arrangements puts it at the zenith of the band’s output alongside such classics as A Salty Dog and Whaling Stories. The inclusion of a raw, orchestra-free version of Grand Hotel as a bonus track, though still exceptional, highlights the elevation these symphonic embellishments give it. With such a strong opener, Grand Hotel pulls out all the stops ensuring it doesn’t disappoint for the remainder, and though the vast scope of the title track proves difficult to surpass, one would be hard-pressed to find a damp squib amongst what’s on offer. They range from the melodic humour of A Rum Tale to the jaunty bossa nova of the closer (and weakest track), Robert’s Box. In between, For Liquorice John, an emotional lament to a friend who committed suicide, and Fires (Which Burn Brightly), an operatic number strengthened by the vocal contribution of Christianne Legrand, both match Grand Hotel for sheer breathtaking elegance. 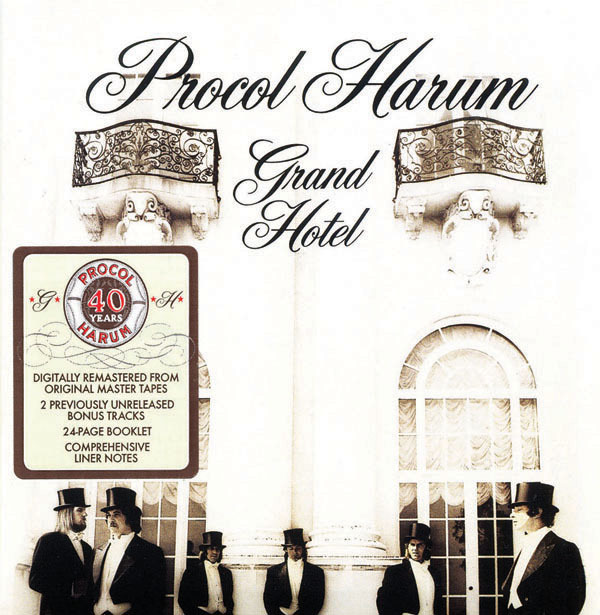 Grand Hotel easily ranks alongside A Salty Dog and Home as one of Procol Harum’s best studio albums.